About a third of his life a person spends in a dream - a lot. Because quite reasonable to take care of that, having been in the realm of Morpheus, feel fresh and rested. Get enough sleep can make not only a comfortable bed with orthopedic mattress, though it is an important aspect, but also makes a contribution and linens. Its quality will also depend on you wake up in a good mood and will be angry at the whole world. The company IKEA is a few series bed linen: For kids, textiles and children's bedrooms. Sound sleep Child guarantees complete rest and all members of the household. That is why to the arrangement of bed for the baby should be approached with great responsibility. Choose the best of everything and, of course, only natural. 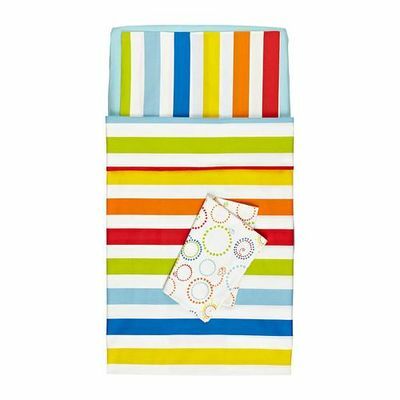 Linens IKEA for the youngest, made from cotton grown in an environmentally sound method with minimal use of chemical constituents. Cotton is known to all its high performance that young children become very topical in view of frequent washings. Also, the material does not cause skin irritations, warm in winter and cool in the summer will bring. All bedding are standard - duvet cover (125h110 cm) and pillowcase (55h35 cm). An exception will be, for example, a set of VITAMINER RANDHaving in its composition bedspread size 90h70 see and tension sheet - 120h60 see. Without exception, all bed linen suit to ikeevskim Cots. BARNSLIG Nutt, Torv Blood, Torv SMULTRON, VANDRING Skoog - Equipped with two-way blanket cover with excellent picture of the front and reverse side. If this is not so important, it sets VITAMINER TRUMMA, BARNSLIG DANS one-way blanket cover will cost much cheaper. If desired, bought bedding sets can be supplemented with a variety of goods from the respective series. Soft bumpers supporting pillows, sleeping bags, blankets - baby will sleep calm, and most importantly long. All bedding made from 100% cotton - a material that is practical, hypo-allergenic, not electrified, and allows the skin to breathe. Behind him is very simple and easy to care for. The only thing you need to bear in mind that it can not be bleached (most sets have a color picture) and subjected to a dry cleaner. 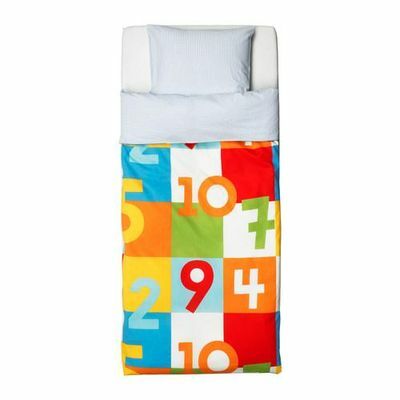 Presented kits for children's rooms include a duvet cover size 200h150 cm and pillowcase 50h70 see. As for the sheets, it can be purchased separately. If your child sleeps on a bed with a mattress, then IKEA offers the option stretch linen sheets. Elastic band, which is equipped with sheets, perfectly straight obtyanet mattress and eliminate the daily manipulation by seasoned sheets. Baby clothes full of riot of colors in tandem with a variety of designs, fairy tales, and with a set of VITAMINER Siffre You can even work out in the long run! Thanks idea ikeevskih designers, bedding sets Torv TREDGORD, VANDRING REV, VANDRING SKOGSLIV, BARNSLIG RAND, BARNSLIG Ulvi, BARNSLIG IOP allow to change slightly podnadoevshy drawing. Simply remove the duvet cover on the back side and a child fascinated with new motives. In this series, linen manufacturer gave vent to imagination, not only in the color scheme, but also in the use of different textures and materials. Monochrome models VINRANKA, Alvin Straw, Intricate storyline set OKERKULLA Swedish, Scottish cell BenzylAristocratic BAKKSOTAWarm and delicate floral motifs Alvin Kvist, Emeline Knopp, EMMY CET, Alvin ERTER, EMMY BLOOMNever timeless strip in OKERFREKEN, NIPONRUS, Dvali and finally, creative solutions to stylistic VENNERNA LYUD or VENNERNA DRAGKEDYA. In this case, pillowcase and duvet cover can be a drawing or different like VENNERNA LYUD. The main emphasis in the manufacture of linen is made on natural at an affordable price, because the basic material acts cotton. Use of such varieties of cotton cloth as satin and percale, proven on the positive side as a material for bedding. 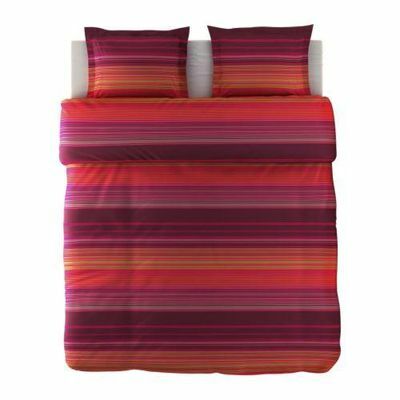 For the most part presented three quarter bed linen with a pillow case and duvet covers 50h70 see 200h150 see. Also in the line sets are present, for example, GESPA 2 of pillowcases and duvet covers, with the only difference that the size of the latter is 200h200 see. Depending on the model, duvet covers can be bilateral and can be alternated pattern blankets for sleeping. They are also equipped with a countersunk fastener, or decorative laces, buttons. These devices According to the manufacturer, ensure that the blanket will not run off and travel the duvet cover. In stores IKEA presented linens for all family members, young and old. Looking into one of them, you will not leave there empty-handed. In conclusion, a few useful links.